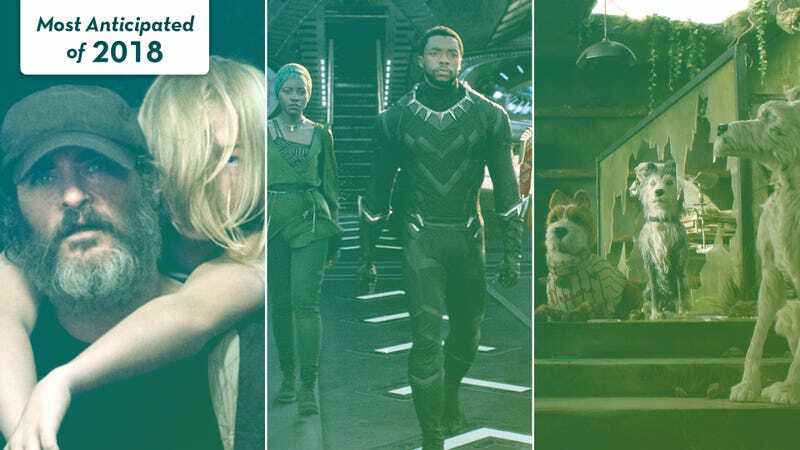 You Were Never Really Here (Photo: Cannes), Black Panther (Photo: Disney/Marvel Studios), and Isle Of Dogs (Photo: Fox Searchlight). Graphic: Libby McGuire. Wes Anderson returns to stop-motion. Claire Denis goes to space. Joaquin Phoenix gets immobile and intimidating, not necessarily in that order. When sitting down to compose a list of the year’s most enticing upcoming releases, The A.V. Club tried to keep it to a manageable 25 titles, we really did. But then we started digging in, really considering everything’s that’s on its way, and it became clear that only double that would do for the 12 months of movies to come. Some of these films have release dates, others don’t. Some we’ve already seen on the festival circuit, others we’ve only dreamt about. All are reasons to get excited in 2018—for cinema, at least. Staying stoked about everything else could be tougher.